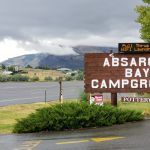 Ask fellow campers about "Absaroka Bay RV Park" and nearby attractions. This is like parking your car in a grocery parking lot -- it's very close. It was OK because all we wanted was to explore Cody, WY. The park has no amenities. We camped at Absaroka Bay RV Park in a Motorhome. We stayed here twice in a little over a week. It was pretty full the labor day weekend but we had good power and water and it was neat and check in was quick and easy. We stay here on the way back from Yellowstone 5 days later and it was pretty empty. The place was still neat and we had no one beside us. The spaces are all pull thrus and while they are close together then are not so tight that you cant have a table and some grass between rigs. The back way in is a lot less of a sharp hill. It asks if the interior roads were easy to navigate. When they were full up it was a bit tight but doable in my rig easily but I used to drive a 42 foot class A and it would have been a bit tight but doable as well but might have had to back and fill a bit to get out. I would not let that dissuade me from staying there as I noticed they put the big rigs on the ends. We camped at Absaroka Bay RV Park in a Motorhome. If you are there during the summer you need to go to the Cody Rodeo. The western museum was also pretty neat and the ticket was good for 2 days. We got some jeans and shirts and boots a Bomgarders across the street too. If you are driving a class C you can park off the main drag one block to the south as there is a public parking lot there that you can fit into. Not a fancy park but it was clean, moderately priced and close to downtown which was what we wanted. There is a Walmart on the other side of town so u could get some groceries. Easy pull through. We enjoyed the Wild West Museum. There is green grass at each site, we enjoyed that. We camped at Absaroka Bay RV Park in a Motorhome. Fun town with fun western things to do like rodeo, free gun fight in downtown, Wild West Museum. Internet worked well. No tv hookups but our satellite (Dish) worked well. 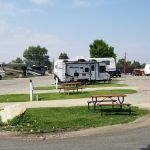 We spent 3 nights in Absaroka Bay RV Park while we visited the Cody area. 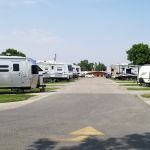 It's not a destination RV park, but it's safe, fairly priced, has full-service sites, and is close to Cody's attractions and restaurants. It's also accurate to state that it's sites are narrow and are often just long enough to fit a larger RV or trailer/truck. The day we departed, we had to request the folks in the site in front of us to move their truck so we could hook-up our trailer and exit our site. Between sites there's just enough space to sit at picnic table. We would probably stay again, but only if we needed to stay within Cody's city limits. We camped at Absaroka Bay RV Park in a Travel Trailer. Sites are small and close together. Very tight quarters when entering and exiting. Park is on the edge of town but located so it is easy to get around. Quiet location. We camped at Absaroka Bay RV Park in a Fifth Wheel. Lots to see and do. Visit the Museum of the West. Allow at least two days for that. Nightly rodeo is fun. Yes the sites are a little short in length, but level. Road noise durimg day but no problem at night. Great location close to center of town. We camped at Absaroka Bay RV Park in a Motorhome. The campground was about average, but if you reserve a pull through, be aware that there is not enough length for your tow to remain connected. 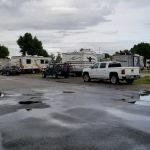 In fact, you are instructed to disconnect before parking and to place your tow in front of the RV, and most sites were just long enough for your registered RV length. This made the entire campground very cramped. Also, in some sites there wasn't enough width for a truck to be in front of a 5th wheel and obstructed neighbors from getting out in the morning. They need to better define "pull through" sites. We camped at Absaroka Bay RV Park in a Motorhome. Cody is a great town to learn history of the West. The Buffalo Bill museum is a must. Stayed in a 43' motorhome seven days to visit Yellowstone NP and surrounding area. Access is easy to CG from rear or front entrance. Smooth, friendly check-in. Big rig friendly-easy to get into site. Interior roads are in good condition-combo of smooth and rough asphalt. Our site E9 was level, gravel/some dirt, FHU PT, no cable, no shade. One side of CG has back-ins. All utilities worked well and are located conveniently mid coach. Site is long enough to fit our MH and park our CRV across the back keeping it off the road. The site has a nice grassy area front-to-back on the awning side with a nice picnic table. However your distance to the coach next door is at best 10 feet when slides are open. Not an issue for us because we spent most of the day out. The comfort station located in the middle of the park has bathrooms, showers and laundry. Did not use baths but quickly looked at laundry room and was clean and comfortable. No fenced doggie area but along the rear of the park is a nice long grassy area that is specified for walking your dog. Bags are provided and a dumpster is at the end. ATT service is good and you have some OTA channels. We used Satellite and it worked well. You are just outside of Cody but within 5 min of midtown and the Irma hotel and numerous restaurants. You have an Albertson just down the road with Burger king next door and MacDonald's 2 blocks away. This CG was a great choice as a home base and it was comfortable. It is not destination CG. When in the Cody area will stay here again. We camped at Absaroka Bay RV Park in a Motorhome. Go to "Buffalo Bills The Irma Hotel" and see the shootout - Get the "Grande Nachos" on the veranda. Don't miss the Rodeo one evening. Visit the Buffalo Bill Dam. Definitely plan day trips to "Yellowstone Lake Lodge", "Old Faithful" and drive the "Beartooth Scenic Drive". Easy in and out. RV park was close to stores and down town. We camped at Absaroka Bay RV Park in a Motorhome. We paid the weekly rate of $238 tax included for a 50 amp FHU site. We had a pull thru as most all sites here are pull thrus. They are not the most level of sites, but we could level. There was some up slope towards the front of the site, we kept our MH to the back of the site. The office did tell us to do so when we checked in. RV washing is allowed for $10, that is always a big plus for us full timers. We had OTA stations from both WY & MT here. Verizon broadband was very good. Wifi was also very good during our stay. Lots of things to see and do in the Cody area. Yellowstone is a long day trip, but the ride has some incredible scenery. Plus all the Cody stuff mentioned in earlier reviews. I wish we had stayed two weeks here. We would stay here again. We camped at Absaroka Bay RV Park in a Motorhome. Two breweries in town and several other places for a cold one. The Millstone was the better bet of the two for something to eat and a good cold brew. Pat O'Hara's seemed more like a place for the younger crowd, only two of their beers were on tap and it was not the kind of place that we like to eat at. Big open garage door to enter and lots of flies. The Irma Hotel and Saloon is also a very good bet and had some very nice mounts inside. It is a must stop while in Cody. Very nice park located on the east side of Cody just passed the airport. GPS may take you to the rear entrance. Front entrance is right before you get to Burger King. Park is not very large so be sure to make a reservation if you have a big rig. Our site was large enough for our 4o foot RV but barely room for our tow vehicle. There are sites for larger rigs. Very nice staff. If traveling to Cody from the east in a RV, do not take HWY 14A over the northern Bighorn Mountains. We took Hwy 16 over the southern portion of the Bighorns. Be sure to research which westbound route is best suited for you. We camped at Absaroka Bay RV Park in a Motorhome. Cody Cowboy Supper and Show. Very entertaining. The rodeo is good too. Things to do: Buffalo Bill Dam, Buffalo Bill Museum (2 day ticket, veteran discounts), Hart Mountain Interment Camp. Long day trips to NE entrance of Yellowstone, E entrance of Yellowstone, Big Hole National Recreation Area, Medicine Wheel National Historic Site (not in RV), beautiful drives of Chief Joseph Highway and Beartooth Highway (not in RV), Red Lodge Brewery in Red Lodge, MT. This is a very clean and well maintained park. The sites are very close together (and short for a big MH), but there is a small strip of thick green grass between the gravel area for parking. With a 40' coach and an F150, we had to park the truck at the front of the rig crossways to be able to be out of the road. The streets are asphalt with some tight turns for a bigger rig. unhook your towed at the office. With our slides out, the neighbor's awing was six inches from our slide. The laundry, showers, and restrooms are in a basic block building but clean and well maintained. Verizon data service is slow, and the park's wifi is slow to the point of unusable sometimes. The GPS address will bring you in the back side of the park. If coming from the east, you can directly turn into the park about 100yds before the GPS has you turn, look for their sign hidden in some trees. This is a good park to overnight at or see the area from. We would stay here again if in the area. We camped at Absaroka Bay RV Park in a Motorhome. You have to visit the Buffalo Bill Center of the West. Your admission fee is good for two consecutive days, you'll need that much time to see it all. Pleasant staff who will help you plan your visit to Cody. Sites are too short for the units they are putting on them. Many vehicles are extending into the roads which can make navigation difficult. Utilities are at the back of the site which would make it difficult to leave your toad attached, but you can't do that anyway because the sites aren't long enough. Great water pressure. No cable. Wifi is poor. Probably wouldn't stay again. We camped at Absaroka Bay RV Park in a Motorhome. 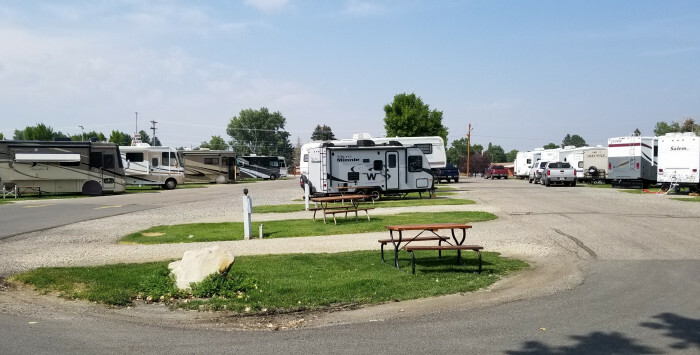 Clean & quiet even tho it's close to 14 spent 8 nights - was close to grocery and within 2 miles is downtown and car rentals We camped at Absaroka Bay RV Park in a Motorhome. Went into Yellowstone for a day. Walked around town, fun shoot out at night. You will see deer close to the campground. Could walk to town from campground, but would be a long walk. A Burger king and MacDonald's within walking distance. Take in the local rodeo that is held every evening during the summer. Cody has the Buffalo Bill Center of the West, and of course the east entrance to Yellowstone is just 50 miles away. Museum offers a senior discount. There is usually a rodeo in town. Use visitors center or campground staff to learn local activities. Buffalo Bill Museum terrific. We did the evening dinner and music show. Good food and entertaining show. there are 2 entrances. If coming from south/east then enter from 14. If coming from Yellowstone then use the Mountain view entrance. Coming out of the East entrance to Yellowstone into Cody has some spectacular rock formations. Buffalo Bill Cody Museum is a must see. It takes 2 days to see it all! Buffalo Bill museum, of course. See the Heart Mountain concentration camp for Japanese-Americans. Very sobering. Pioneer museum in Powell has a lot of local history. Old Trail Town in Cody has some mountain man and pioneer history but also a lot of old junk. See Curley's cabin - reason we went - he was a Crow scout with Custer at LBH but was smart enough to get out of there once he did his job. Lot of sun, wind, and hydro potential here, not sure why that isn't booming? The Wild West Museum was a highlight while in the area. Medical facilities and Doctors in Cody area are top notch. Take a trip to the Buffalo Bill Dam about 5 miles west of town. It is beautiful scenery, very informative and FREE. Go to Libations down town and get a "pain killer". Take it home, no drinking and driving. The Buffalo Bill Museum of the West is definitely worth spending a couple of days touring. The trolly tour around town is interesting. A stop at the Cody visitor's center will net you a lot of information. Buffalo Bill Museum was well worth the visit. Cute downtown area. Be sure and go to the Irma Hotel or the Chop House if looking for a place for dinner. Both were excellent. Granny's is great. Irma's has a great buffet and good food, and Zapata's for Mexican was wonderful. Bubba's is a must for BBQ. A must for sightseeing, Chief Joseph Scenic Drive, the Buffalo Bill Museum and Dam, and the Heart Mountain Japanese Internment Camp. The Buffalo Bill Cody Museum is a must. Buffalo Bill Museum is great. Driving distance within a few miles to downtown Cody. Lots of diverse restaurants in town. There is even a Walmart in town for those who like to shop in them. If you're here in the summer season - don't miss the nightly rodeo. For a nice 1/2 day trip, take the Belfry hwy north to Red Lodge Montana. From Red Lodge take the Beartooth hwy southwest over Beartooth Pass, then run over to Cooke City Montana. From Cooke City backtrack on the Beartooth hwy to the Chief Joseph hwy to head southeast back to Cody. Spectacular views and you can drive over the tallest bridge in Wyoming on this route. The Buffalo Bill Cody Center of the West Museum is a must see while in Cody. Also, Pat O'hara's Brew Pub is a very good and fun place for food and drink. Good biking. Bike north and over to Beacon Hill Road around airport for a nice loop (about 3 miles) - very light traffic on these roads and beautiful vistas in all directions. Be sure to visit the Veterans Memorial park just before you reach the campground entrance coming in toward town. Zapatas served great Mexican food. The Buffalo Bill Museums were amazing. We really enjoyed Dan Miller Cowboy Music show. Close to,Cody where all the action is...get info sheets at office about activities. Burger King just down the highway. We drove out to the Internment site and that was very interesting. We also drove up to the dam. Beautiful views. The city of Cody is interesting as well, we took in a show with western dinner which was just okay. Fast food restaurant next door and another across the street. Food market close by. Are you affiliated with Absaroka Bay RV Park ?